Auditory attention is fundamental also in serious games. 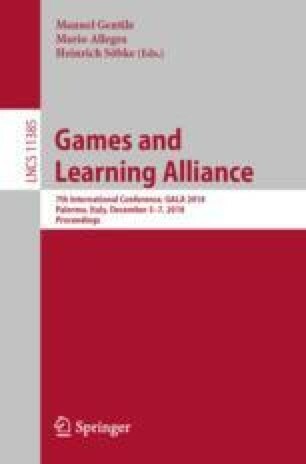 This paper synthetizes the results of a recent statistical analysis of auditory attention of non-native learners and proposes indications for serious game design. We propose a 3-dimensional difficulty level model that can be applied both for designing game levels and adaptivity to keep a player in the flow. The model suggests using background noise level as a prime factor to increase the difficulty of the game, followed by the length of the stimulus and the semantic complexity of the message. We also propose the concept of a mini-game format specifically aimed at training auditory attention and performance. As a format, it could be easily customized in different context domains and implemented as a service or a game engine plug-in.